While it is possible to use one control file to work with multiple data or binary files by using a few options in the .ctl format (specifically for files of identical spatial dimensions but for different time periods), I find it much easier to move around numerous .ctl files in GrADS. This tutorial is going to show you how to open more than 1 file at a time as well as address the main hiccups encountered when handling more than one file. To start out we will need two files to work with. For simplicity we will use two files with the same spatial dimensions and variables. Before we start, since we are dealing with more than one file in this tutorial, we will use the 'reinit' command to close all of our current files as to not get ourselves tripped up. Then, we'll start by opening these two files. Once our two files are open, we will use the 'q files' (not to be confused with q file) command, to list our open files. Once your dfile is set, you treat GrADS as you normally would with just one file. 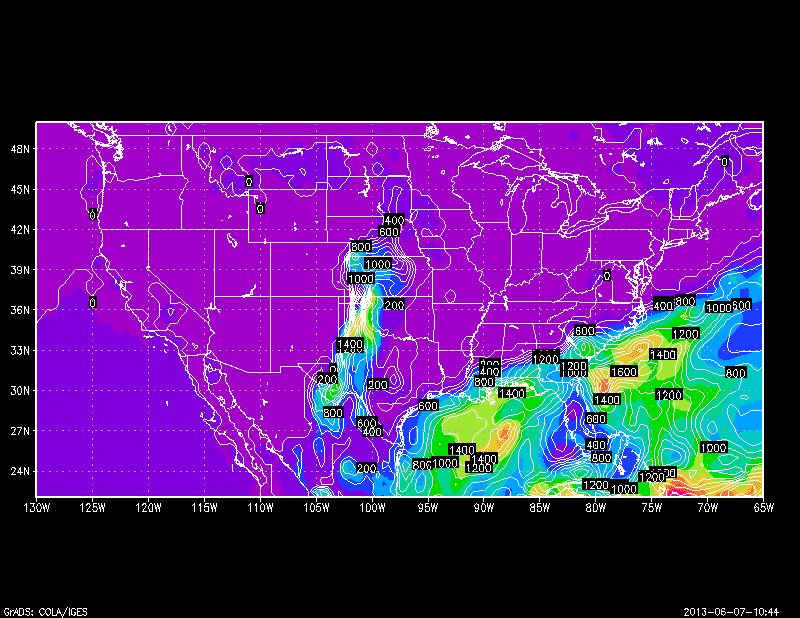 So, we will continue this example by plotting CAPE from the GFS output, we will start with file 1. Now, lets move on to file 2, and plot CAPE at the same time as a model comparison. However, since the time of the model initialization has switched, when we work with file 2, we will point to the actual time, not the timestep as we did in file one. So our command will be 'set time', not 'set t' First, we will need to get our time though, and we will do that with the 'q dims' command. Now, we have our comparison map, since these files were identical spatially, we did not need to change the lat/lon dimensions around. However, I will mention that in general it is not a bad practice to reset all of your space and time dimensions every time you switch from one file to the next, just to ensure that you are plotting everything correctly. Now, this brings me into the special case: If both of your files have the same spatial/time dimensions (for example if you were comparing two runs of the WRF, or different GFS ensemble members), you can short cut without having to go through the 'set dfile' commands. Again, only use this shortcut if your model dimensions, are identical, e.g., grid spacing, timestep, etc. The main problem you will run into handling multiple files in GrADS is an "Entire Grid Undefined" error. This is simply because you didn't reset the dimensions to fit with your file. If you get this error, simply do a 'q dims' command, see where x,y,z,t fall outside of your file dimensions. So that is all for the basics of file handling in GrADS. Hope you found it useful! If I had to guess, your problem has to do with not resetting the time/height/lat/lon dimensions when handling the new file. Basically, you are trying to plot file two with the dimensions of file one. Check on this by doing a 'q dims' command after you 'set file 2'. This should tell you which dimension is outside of the file limits. Then just reset, it to what you want. can i overlay 1 dimension 1 x,y,z for 2 file? I am using two variables; surface temperature and geopotential height at 500hPa. time,lat and lon are same but z is different. My question is how to reset the z level, so that both variables can be displayed together. would you mind to post sucah an example, i want to compare daily in file1 with monthly in file2.. like an anomali..